More than a week ago, Attorney-General Eric Holder said in a speech in recognition of Black History month, "Though this nation has proudly thought of itself as an ethnic melting pot, in things racial we have always been and continue to be, in too many ways, essentially a nation of cowards." Critics noted how strange it was for the nation’s first African-American attorney-general and member of the nation’s first Black president’s cabinet, to lecture fellow-Americans on racism. After all, a majority of the electorate had voted last November for now President Barack Obama. Remarkable as that election result was, it does not mean that racism is dead in America. Ironically, on the day when Holder spoke about racism, the New York Post published a shocking and, at best, insensitive cartoon by Sean Delonas. 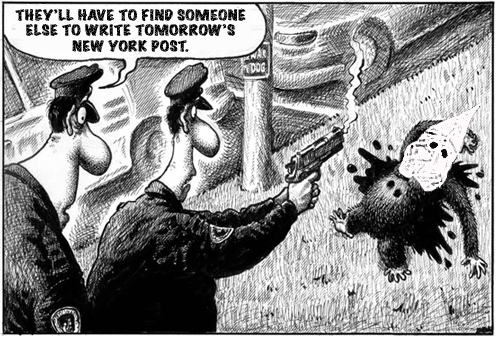 Showing a cop shooting a monkey to death while his partner says “they'll have to find someone else to write the next stimulus bill,” the cartoon referred to two recent news events: the signing of the stimulus bill by President Obama and the killing of a violent chimpanzee in Connecticut by police after the “”pet” had mauled a woman. Not a credible explanation at a time when hate groups multiply their membership in reaction to the election of a Black president of the United States and the deepening economic crisis. The Southern Poverty Law Center (SPLC) that monitors hate groups just released its “Year in Hate” compilation for 2008. According to the report, the victory of Barack Obama in the presidential election and the economic crisis were and remain the most important factors in the recent surge of the hate group community in the United States. As the editor of the Southern Poverty Law Center’s Intelligence Report, Mark Potok, put it, “Barack Obama's election has inflamed racist extremists who see it as another sign that their country is under siege by non-whites. The idea of a black man in the White House, combined with the deepening economic crisis and continuing high levels of Latino immigration, has given white supremacists a real platform on which to recruit." The Obama administration has not repudiated the most troubling Bush administration’s human rights violations in the treatment of terrorists and alleged terrorists, namely torture and extraordinary renditions. Among the president’s first executive orders was one that banned coercive interrogation methods beyond those techniques listed in the Army Field Manual. But CIA director Leon Panetta said during his confirmation hearing that he would ask for additional authority if those techniques would not be enough to get a detainee to spill the beans about an imminent terrorist attack. This was precisely the red herring that the Bush administration and the authors of the “torture memos” used to justify “aggressive interrogations” or torture: a terrorist who knows about a ticking bomb that will cause unspeakable harm unless he can be forced to talk. Jane Mayer in her excellent book “The Dark Side” and Philippe Sands in his equally gripping “Torture Team” reveal that Jack Bauer of the Fox TV-series “24” influenced the American interrogation doctrine of the Bush administration. John Yoo and other legal experts who rendered opinions in support of torture were enthusiastic fans of the show and its hero. The “ticking time bomb” scenario that Panetta alluded to is effective in “24” fiction and Jack Bauer heroics and often used in real life to justify torture. Thus, four weeks before leaving office, Cheney said in an interview with the Washington Times that aggressive interrogations were “directly responsible for the fact that we've been able to avoid or defeat further attacks against the homeland for 7 1/2 years." Never mind that there is not a shred of evidence that this scenario unfolded in the post-9/11 war against terrorism. But based on what he said during his confirmation hearing, the new CIA director has also bought into this “ticking bomb” myth. Amid much hue and cry about the $18.4 bn in bonuses paid on Wall Street for 2008 (even though this was down sharply from the $39.3 bn paid out the previous year), the president has announced compensation limits of $500,000 for managers of firms receiving TARP money. For the public, this will afford a temporary feeling of revenge on those who got us into our current financial mess. For firms, it means a set of new constraints on how they can do business. The question is how to maximize subject to these constraints. How, that is, should the finance industry – which, after all, is still an important sector of our economy – adjust to these rapidly changing circumstances? Assuming that one can actually hold a conversation with an industry, I would suggest the following playbook. a) For most political leaders, not all, the issue is not the compensation per se. What they are trying to eliminate is the unholy trinity of waste, fraud and abuse that they now see as rampant in the financial industry, and, rightly or wrongly, blame for the financial crisis. b) Usually, the satanic trio is sanctified through the sacraments of good governance: transparency, accountability, and disclosure. c) Your job is to come up with a set rules and regulations that meet these concerns, before they SOX (Sarbanes-Oxley) you. a) All financial institutions (bank holding companies, broker/dealers, hedge funds, wealth advisory firms, etc.) will be subject to registration and disclosure requirements. b) Financial institutions managing more than $100 billion in assets will be subject to regulatory supervision under the Banking Holding Company Act. c) Federal regulation will be divided along functional and product lines, independent of the type of financial institution (bank holding company, hedge, private equity, etc.) undertaking the activity. d) Derivatives, Credit Default Swaps and other complex instruments will be traded on a regulated exchange. All Derivatives and Credit Default Swaps not directly linked to the asset held will be regulated by the SEC as a security and follow the same disclosure rules. e) The sale and distribution of all securitized assets is to be accompanied by a mandatory due diligence report, based on a random sample of the underlying asset quality, to be published in a prospectus registered with the SEC. f) Banks and loan originators are required to sustain loan recourse reserves of at least 15 percent. g) Asset managers will not be allowed to clear their own trades, but must rely on independent third parties for execution with notification to the client (John Coffee's anti-Madoff provision). Big boys crying foul, after they themselves broke the rules, will find their complaints falling on deaf ears. What to do? a) Work the relevant House and Senate committee and sub-committee chairmen. Any legislation working its way to the legislative floor has to go though the mark-up process. This is the key veto point to hash out the details. b) Focus on Democratic and Republican moderates; they hold the swing votes now. · Remember, previous analysis of the bailout votes showed defection from the wings: both the liberal Democrats and the conservative Republicans failed to support the initial bill, and it was the moderates that pushed it though. · Once again in the passage of the stimulus package it is the Senate moderates who are crafting the legislation. · Many of the changes in the playbook can be rewritten through executive rule-making. · This is a preferable strategy as it minimizes the risk of extraneous provisions that can have unintended consequences. · It also circumscribes the scope of the agency rulemaking to its specific jurisdiction. · Compromise on pay limitations. Give public officials the visible win of cash caps and disclosure of executive perks in exchange for performance-based compensation. In fact, you may even do better. · The stock appreciate rights (SARs) approach JP Morgan adopted is an interesting model moving forward. · The real bite will come if regulators limit your revenue stream. For example, if they introduce regulations that prohibit the use of CDSs or Bank Holding Companies from both underwriting and providing consulting services or segregate consumer credit from commercial lending, etc. · Anything that goes to the bottom line needs to be out-of-bounds. The rest is just a ride on the merry-go-round of regulatory reform; you may get a little dizzy, but no lasting damage. · The best public posture is to acknowledge that there is a real need for more effective enforcement of and compliance with existing laws and regulations, which for the most part are adequate but unevenly applied. · Working to improve the strength of the regulatory process will weed out the good companies from the less worthy. Rewriting the playbook is never easy. Rule changes will clearly have implications for who wins and who loses. But strong, competitive firms can always adapt. It requires financial industry leaders to think not only about current sources of revenues but where future opportunities lie. But this is what good managers making $500,000 a year are paid to do all the time. Let’s play ball! Two random thoughts on different topics, but with similar motifs. First, there's much twitter in the blogosphere about how right-wing "fresh-water" economists are embarrassing themselves by showing that not only do they not really understand Keynes, they don't even understand their patriarch, Milton Friedman. They are spouting nonsense that was refuted half a century ago and was banished from polite discourse in the economics profession, only to reemerge at a time when the country most needs clear-thinking analysis of the tremendous problems that face us. Instead, though, these supposed great minds are spewing forth ridiculous garbage, cluttering up the debate and providing ammunition to those who really do want Obama to fail. It occurs to me that while Republicans controlled the presidency, they rarely drew on the really talented conservative economists -- there was no Larry Summers equivalent in any recent Republican administration. This has been noted, usually in terms of regret that our economic policy hasn't been better formulated. True though this is, it occurs to me that the problem works the other way too. The fact that these economists haven't been in government means that they've been allowed to develop their theories completely detached from the real world. Economists are an arrogant lot to begin with, and if you add the fact that they come from Chicago -- and hence assume that they are superior to other economists -- and that they have no real-world experience to check these tendencies, you get.... Well, you get an economist making the sort of elementary error that British bureaucrats were embarrassed to make over 50 year ago. Second, a number of my colleagues and I have been wondering why the Obama administration has been dithering over the stimulus bill. Amid great fanfare, they put it out there, then just kind of sat back and let the Republicans drive the debate. They may now be waking up to the sad reality that they have to fight for their bill to get it passed quickly and in something like its present form. Here too, I think the answer may lie in an "other side of the coin" argument. I gave a lot of interviews around inauguration time saying how things wouldn't be so different, since Obama had effectively been president already for two months. He had tried to sit back after the election and let the Bush administration handle things, but everyone wanted to know what he was planning to do about the economy. So his daily press conferences and meetings with advisers turned a presidency-in-waiting into, really, the presidency. But perhaps the relative smoothness of this period lulled Obama into a false sense of security. He had already been president for two months, he seems to have thought, so January 21 lost its sense of importance and urgency. He could just pick up where he left off on January 19. Such, obviously, was not the case. Obama has discovered that, as the real president, people take shots at you they didn't take before. Once legislation is actually introduced, the other side does its darnedest to tear it down. You can call for bipartisanship, but if the other side doesn't play ball you end up looking weak, compromising, and losing the initiative on the most important policy moment in decades. Obama has to shake himself out of this funk, stop moving in slow motion, and tell the Republicans: this is my bill. We have to pass it or something very much like it, and we have to do it soon. If you have alternatives, write them up as amendments and we'll have a look at them. But the time for theorizing is past. We had an election, the public voted for the Democrats' approach to getting the economy turned around, and that's what we're going to do. You can get on the bus or continue to be the party of Hoover (even making the exact same arguments against stimulus that were made in 1933) -- it's up to you. But this bill is going to be passed and passed soon, with or without your help." During the primary season and the general election campaign Barack Obama promised real change in Washington. Not cosmetic change. Goodbye to the entrenched politics of special interests that trumped the common good. No lobbyists in his White House and administration; instead, a new breed of public servants with highest ethical principles. Merely two weeks into his presidency, Mr. Obama’s scorecard is disappointing. He and his inner circle that was so successful in sticking to the winning message of change during the campaign laid bare a disconcerting Promise v. Reality gap. While fulfilling the promise by proclaiming strict new ethics rules for public officials in his administration, the president violated those values immediately when he exempted first his now secretary of the treasury and then the designated secretary of health and human services. By backing two men for cabinet posts even when it was crystal clear that they did not pay substantial amounts of their taxes, the president embraced a double standard that does not bode well for his credibility on ushering in the promised new era of responsibility. We now have a treasury secretary in Timothy Geithner who also oversees the Internal Revenue Service, the very agency that prosecutes tax cheaters. Never mind that Tom Daschle threw in the towel, the fact that the president continued to back him as secretary of health and human services and as health care reform czar, was a slap in the face of his campaign promises. His tax problems aside, how in heaven would you want to have with Daschle a man in charge of reforming the health care system who has had a lucrative and cozy relationship with the very health care industry that has stood in the way of fundamental reforms for the benefit of the American people? Unlike Rush Limbaugh who has said that he wants President Obama to fail, I support the president and I want him to succeed with the important policy initiatives he promised.